COMMUNITY GATHERINGS CREATING AWARENESS OF HEALTHY LIFESTYLES AND CONSCIOUS LIVING All Things Wellness Events & Expo’s mission is to provide opportunities to gather, teach and share experiences toward alternatives and options for conscious living, healing and unity. Our Values: Empower and inform the community about the natural healing ability of body, mind and spirit. Provide vendors and presenters of the highest degree of integrity, quality and value of service and products. Respect the needs and well being of all lifestyles looking for information and resources. Our Purpose: Provide opportunities to meet and learn from practitioners serving many fields that helps facilitate balance and wellness. To seek businesses that offer holistic approaches, and utilize organic, cruelty free, and environmentally conscious resources to the best of their ability. To include businesses that use ethical and empowering practices. We invite you to share our vision and mission toward living your best life. Can you feel it? The excitement….it’s growing and so is our Inspired Living Expo! We continue to add amazing speakers and producers of holistic services and products! There is a wide variety for you to sample and learn from, as you may consider a healthier, more conscious alternative to various areas of your life. We are honored to have Brian Clement Ph.D., L.N. Director of Hippocrates Health Institute! Dr. Clement will speak Sunday, April 7 at 2:30 – 5:00 pm. This and 90% of our Expo’s Presentations are FREE! We have several integrative physicians who will speak and/or have a booth where you can sample a session, products or ask questions. We also have community and environmental services or information. Health, Life, Spiritual coaches and counselors are also excited to meet you! And of course, we have wonderful crafts, jewelry, art and readings are also available. We are also fortunate to have violinist Martin Lopez serenading us throughout the weekend! Martin will be located in the lobby and available to discuss his non for profit music academy for children. 10% of Admission tickets will be donated to Fresh Market’s 1-3-5 Food Drive! ATWE will also unveil our future community project – here’s a hint…. children are the heart of our community… the rest? You will have to find out at the Inspired Living Expo! All attendees will also have the opportunity to view the movie HEAL – FREE! Please visit our website to learn about all the different practitioners and vendors that are available to you. Follow us on Facebook, where we also post articles that are helpful in your daily life and introduce you to the many practitioners and vendors offering their holistic products for healthy living. Here’s a sneak peak at what you can expect at our Inspired Living Expo! ATWE is a Not-for-Profit organization. We are focused on you! Our efforts are far reaching, as we strive to educate the community and support our practitioners and vendors. When we come together towards a common goal, we can achieve great things. Okay, for all of you who live in sunny climes, Happy Days to you as well, right now we are wishing we are where you are at. We, in the Midwest are hunkered down, practicing the Power of Positive Thinking that Spring is right around the corner. Less than 2 months until the Inspired Living Expo. The list of holistic practitioners and vendors of products that will enhance your life, your loved ones, and your animal companions is growing. We are so excited that holistic practitioners and purveyors of environmentally safe products are seeking us out and in agreement with our Mission Statement, to teach and share alternatives and options for conscious living, healing, and unity. All of us at ATWE are very busy, bringing to you an Expo that will help you live your best life in mind, body, & spirit. We will begin sending you information about our wonderful presenters who will grace our expo, plus the exhibitors who work so hard on your behalf. Last night we celebrated the passing of 2018 with Auld Lang Syne, and today, we awake to a new year. Let today be the new beginning for a year, where we start afresh. Every journey begins with a single step. Let us look ahead to a year filled with promises of possibilities and wonders. Appreciation for all we have and all that will come our way. Finding ways to be better. Better at being kind and generous. Better at being humble. Better at giving your best each day in whatever you are doing. Welcome and embrace change. Learn to understand change vs. fearing change. Inspiration, search deep within yourself, you are a Creator. Once you find your inspiration, you must Focus and Discipline yourself to bring your Creations into reality. Practice the two Ps: Patience and Perspective. Enjoy the journey, don’t rush to the destination. Savor the experiences, good and challenging, and put them in perspective of the cosmos. There is an infinity of opportunities awaiting you, which road will you take for your journey this year? Our excitement is building as we continue to bring in more Members, Exhibitors and Presenters for our Inspired Living Expo! For this expo, we have decided to allow non-members to apply for a booth. As we go through these applications we always come fall back on our Mission, as we ask “are they heart centered, respectful and responsible?” We have other criteria, but each individual’s core passion and commitment to serving others is a cornerstone to what we are creating at ATWE. Tickets for this expo are available through Eventbrite or at the door. blessings on your Journey in 2019. Please, visit our website to learn more about ATWE and all we offer. Our Directory continues to expand as more practitioners, educators and vendors join our growing family. Don’t forget to follow us on Facebook, where we feature articles on all facets of healthy living and videos full of information. Here we are, in the season of Joy, Giving, Receiving and Sharing! Such a magical time this is! No matter what is happening in your life, take some time to go within your heart and feel the warmth that resides within the hearts of all. Our Inspired Expo 2019 is moving forward, with a bit of a change. We have decided to allow non-members into our April 6-7, 2019 Expo. All who wished to be part of this wonderful opportunity are invited to send us a Vendor Application, which is found on our website. If interested in becoming an exhibitor of our Expo, be sure to check out the changes we’ve made in our Memberships! We found a way to ensure a full year of membership, no matter when you join! Soon, we will begin to reveal who will be exhibiting, what they are offering and who will be presenting in our 2019 Expo. We are still looking for more volunteers to help in the smooth running of our Expo – there will be appreciation bags and free lunches to all volunteers! Don’t forget to check out our Calendar for classes and Directory for gift ideas. Many of our Members provide Gift Certificates for services and products! Take a look at our latest video to learn a little more about what we do! We invite you to join our vision and mission for a healthy and whole future! The month of November is associated with the feast of Thanksgiving. Tis a wonderful feast and tradition that brings family and friends together. But we would be foolish if we were to limit our gratitude to just one day. By making a daily practice of acknowledging our growth, blessings and opportunities, we embody the true meaning of Thanksgiving continuously. If we embrace the true and everlasting meaning of thanksgiving, we enhance our abundance in all ways. Gratitude is a type of meditation. All that is required is a few moments, to reflect on all the people and things you are grateful for. Remember, gratitude is not just about being thankful for all the good that has graced you, but also the trials and tribulations, for they are the impetus for your continued growth and the myriad of abundance awaiting your acceptance. We at All Things Wellness Events & Expo or ATWE are grateful for the opportunity to assist and enhance your lives by introducing healthy and holistic alternatives and opportunities. We appreciate your time, trials and struggles, and are eternally Grateful for you. We are committed to providing our best efforts toward enhancing your lives in all ways. It is difficult to fathom that it’s October already! As farmers are harvesting what is left in the fields, we celebrate all the good things we have in our lives. We at All Things Wellness Events & Expo, or as we refer to ourselves “ATWE,” are celebrating our connection with you! It is through you that we can share the knowledge base and skill set’s of our Members. These Members are the holistic practitioners and providers who have joined us. So, while everyone begins to wind down and take a breath before the holiday bustle, all of us at ATWE are busy welcoming new Members into our special community. We are also working on next year’s, ‘Inspire Living Expo,’ to bring you the latest in holistic healing modalities, products and services for a healthy life. We invite you to visit our website to learn more about whom we are and what we offer. We also maintain a growing Directory of the modalities, products and services our members offer. Don’t forget to follow us on Facebook, where we feature articles on all facets of healthy living and videos full of information. News about our Inspired Living Expo is good! We are also continuing to sign on new Members! These Members are practitioners and vendors who have gone through ATWE’s application and approval process to join what we like to refer to as our ATWE Family. Our Purpose and Mission is at the forefront of everything we are attempting to accomplish – we are trying to get this right! Our 2019 Expo booths are filling up, but with plenty of availability left. One of our goals is to offer information and presence from every area of one’s life. This means each holistic, alternative or organic modality, service or product offering has a limited number of booths, divided into sections of the space we will occupy. We do this to honor the publics and vendors ease and comfort. In particular is the need for quieter areas where discussion, mini sessions or readings can take place. We are hard at work putting more pieces of our not-for-profit organization together. The question in the back of our minds is “What else must be done to fulfill our Mission?” One of the key points of our Mission is to provide a supportive environment for our Members. To help fulfill this part of our Mission, we are organizing ATWE Group meetings where we can connect, share information, answer questions, brainstorm and enjoy a cup of coffee together. Our first Group meeting is this month and we are excited to connect with our Members! Another way we felt we could honor our Mission for both our Members and the public was to create a Practitioners Class Calendar page on our website. This way, our hard working Members can offer their expertise through classes in their own place of business! This works great for ATWE’s Mission toward educating the public to the alternative possibilities that exist outside of mainstream’s point of reference. ATWE is in no way responsible for the content or actions of our Members outside of ATWE’s Events and Expos. Our Directory continues to expand its pages of modalities and services with the offerings our expanding number of Members provide. It’s a daunting process, but we think you’re worth it! We have included a new page on our website entailing the wonderful benefits our Members can expect from us. We welcome potential Members who believe in our Missions goals! The first step is to fill out our Participation Application. If approved, the Membership process begins. We look forward to the ongoing growth of our organization and new Members who share our enthusiasm for an informed and unified community! We would love to hear from you too! Help us understand better ways of serving your needs. On that note, we are always looking for help within our organization. If you are interested and would like to volunteer some of your time and expertise, we would love to hear from you! Last month we told you about our plans for a 2 day health expo April 6 – 7, 2019. We have now chosen, Inspired Living Expo as our theme! This theme will encompass a “holistic” way of living for all areas of our lives. Now our goal is to enhance the expo experience for you, and our vendors. To achieve this goal, we are hard at work to bring a holistic and varied blend of vendors, practitioners, as well as guest speakers. One of our treats to you, is a free showing of the movie HEAL! Saturday, April 6 at 6 pm, we will begin the movie. We will have some practitioners on hand to answer any questions you may have after the movie, until 9 pm. We have signed a, national renown speaker and Tedx presenter Hanna Stonehouse Hudson! We are excited to have her and we’re sure you will enjoy her inspirational speech. We have much more in the works for our Inspired Living Expo, so stay tuned! ATWE Newsletter – July 2018 – Save the Date! 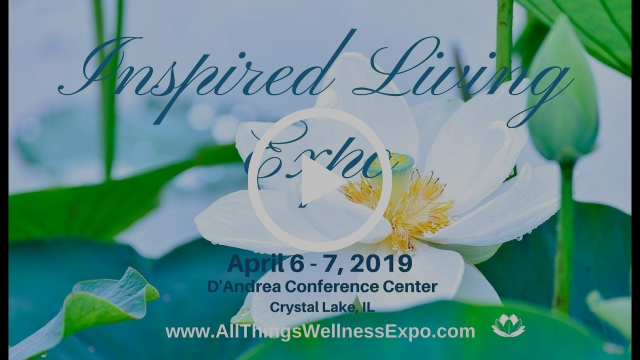 April 6 – 7, 2019, ATWE will be hosting a 2 day Holistic Health & Lifestyle Expo at the D’Andrea Banquet & Conference Center in Crystal Lake, IL! We are busy planning this two day event to make this expo a vendor and visitor friendly venue, offering the latest in the holistic health & lifestyle options.This expo will provide a wide variety of modalities, information and products that span every area of one’s life. We will have approximately 95 booths. In addition, we will also have two large rooms available for classes, demonstrations, & presentations. The D’Andrea with its beautiful decor, lends a peaceful setting that promotes the healing of the mind, body, and spirit. D’Andrea Banquet Hall is located at 4419 US-14, Crystal Lake, IL, next to Rt 31 ramps. This area has easy access to a variety of eating establishments. Plus, the Holiday Inn is less than a mile away from D’Andrea if anyone wishes to stay in the area for both days. We will be sending you more information about the expo as we continue creating and organizing a one of a kind weekend for all! We now have a web-page called “Practitioners Class Calendar.” This gives our approved practitioners more opportunities to share their wisdom and techniques throughout the year! Spreading Awareness is a very important element of ATWE’s Mission! The practitioners with class listings are solely responsible and must be contacted directly for more information or to sign up. We will continue to look for ways in which we can serve you and increase our connection to the community. We would love to hear your ideas and suggestions! Imagine opening your eyes first thing in the morning, stretching in your body in the bed, walking into the bathroom and catching that first glimpse of yourself first thing in the morning……..
Each month, we will post updates of our upcoming events and expos, in addition to helpful information from our practitioners and vendors with links to access full blogs and articles. Enjoy! Our 2019 Expo is underway! Now that our HEAL Event is over, we have our sights set again on our annual expo. We were not ready to provide the expo of our dreams this year, due to timing issues. However, we are now in the planning stages of our 2019 Expo! April 6 – 7, 2019, we will fill the ballroom at the D’Andrea in Crystal Lake with approximately 100 vendors, plus informational classes, demonstrations and much more! Stay tuned for more information about our Expo in the coming months! We would also like to announce that we now have a Directory! This is just another way we can assist you in your search for better health and a happier life. You can access this directory either through our newsletters or from the menu on our website! We are still adding our approved practitioners and vendors to our directory. Plus, we are also expanding the modalities, areas of service, interest and products that are available through our trusted group of individuals and businesses who provide them.